In patients who have not had a previous heart attack but are suffering anginal symptoms, a 12 lead ECG may be useful but is likely to prove normal unless they are experiencing the chest pains at the time. If there is any doubt as to whether or not the symptoms that the patient is complaining of are indeed coming from the heart and are angina then one of the most useful tests, if the patient is capable of performing one, is an exercise test done under controlled conditions. The patient is wired up for a full ECG and then asked to walk on a treadmill or cycle on a static bicycle whilst the ECG is recorded. The idea is to get the heart working progressively harder in a controlled environment and to see whether or not the patient develops their typical symptoms and/or whether the ECG shows changes which are typical of those that we might expect to see if the muscle of the heart is not getting a sufficient circulation to match its energy requirements as it increases its workload. This test can be useful in confirming the diagnosis and also suggesting the degree of severity of any underlying coronary disease. 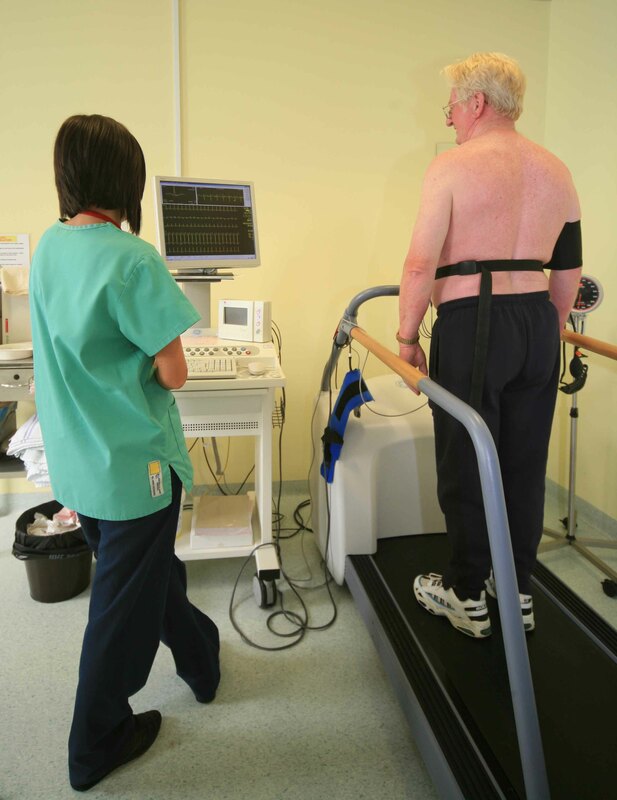 Patients do not have to be particularly fit to be able to undertake an exercise test but clearly they do need to be able to walk freely and those with mobility problems due to arthritis and those with significant respiratory disease causing breathlessness on minimal exertion may not be capable of undertaking an adequate exercise test. To achieve an adequate exercise test we usually try to get the heart rate up to at least 85% of a figure called the 'age predicted maximum heart rate' which can be calculated as 220 minus the age of the patient. Scientific tests over the years have shown that if somebody can get their heart rate to 85% of their age predicted maximum heart rate without symptoms and without ECG changes it is very unlikely that they have any significant underlying coronary disease which will lead to problems in the short to medium term. He was then exercised on a treadmill with continuous ECG recording. After 4 minutes and 30 seconds of exercise he had developed chest tightness at a heart rate of about 140 beats/min which was 85% of the age predicted maximum for a man of his age. The ST segments show significant depression in several leads (II,III,AVF,V4-6) indicative of poor blood supply to the inferior surface of the heart and the lateral wall of the left ventricle. He was offered coronary angiography which confirmed severe coronary disease and he underwent coronary artery by-pass grafts. This was in 1996 and he is still alive and well today.